Epicor ERP is the result of years of innovation and development: a next generation ERP solution based on Service Oriented Architecture (SOA). It combines many versatile functionalities into one effective and manageable system. Technology is the base upon which the modern business solutions are built. Epicor ERP works on the terms of the business, adapting to the processes and enhancing all the activities. As Epicor ERP is based on the modern True SOA, it is reliable, dynamic, configurable, and it enhances both the productivity and internal cooperation of the organisation. Epicor ERP is scalable from organisations with one site of operation to multinational corporations. Se standardizes the processes, practices and equipment of an organisation into one clear entity. In addition to that, Epicor ERP compiles all the essential information through its reports and metres, to support the decision making. Epicor ERP is available in several languages. The system supports country-specific settings, and it is easily adaptable according to organisation's requirements. Epicor ERP integrates flexibly to existing software through its Service Connect function. In addition, it comes with ready-made interfaces and integrations with e.g. Microsoft Office products. The user experience of Epicor EPR is in a league of its own. The polished looks, integrability to other systems, option for simultaneous use, and numerous tools make Epicor ERP a pleasure to use. Users may configure Epicor ERP user experience according to their preferences, thus speeding up the daily use and increasing productivity. What is Service Oriented Architecture? Service Oriented Architecture is based on understanding the processes and providing them as logical services. The services form entities, taking the needs of business activities into account, and hiding the unnecessary complexity "under the hood". All communication takes place through standardized web service interfaces. 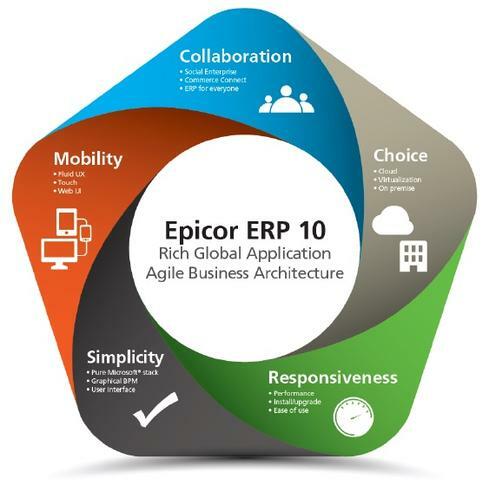 Epicor ERP is a system based fully on Service Oriented Architecture. The technological basis we have the trusted Microsoft .NET platform, with standardized techniques and languages. The XML-based communication means easy integrablity and adaptability. The functions and processes of the system can be changed without touching the system code. Weekdays 8 a.m. – 4 p.m.